← MARGARET O’CONNOR. Changing the culture of the church. ANDREW GLIKSON. 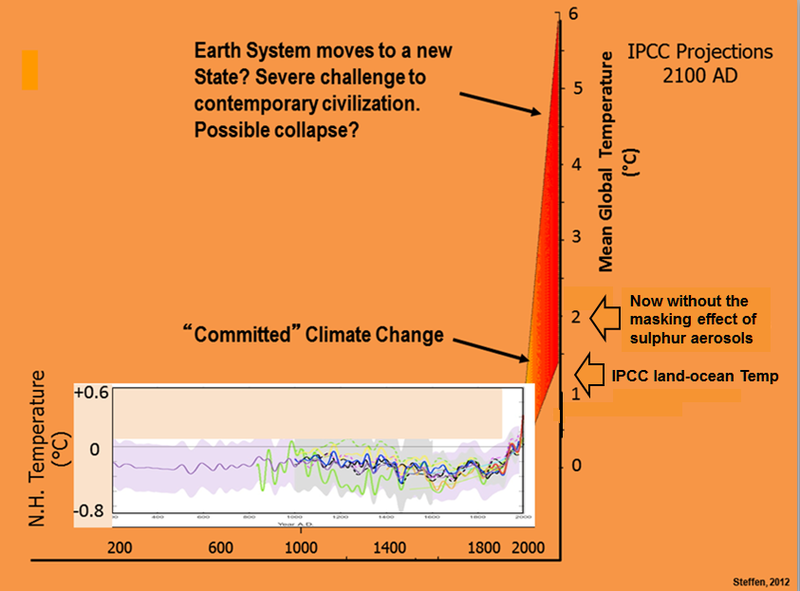 The road to 2oC and beyond: IPCC warnings of extreme global warming. Scientists of the Intergovernmental Panel on Climate Change (IPCC) indicate that global temperature rise of 1.5°C above pre-industrial temperatures would constitute a threshold the planet cannot cross without suffering the worst effects of climate change. Yet according to the U.N. report, mean global land-sea temperatures have already risen above 1°C and the planet could pass the 1.5°C threshold as early as 2030 if greenhouse gas emissions continue at the current level and no effective CO2 down-draw measures takes place. These projections underestimate what is happening in the atmosphere-ocean-land system since, due to amplifying feedbacks from desiccating land, warming oceans, melting ice, methane release and fires, no temperature limit can be specified for global warming. The Paris agreement, which focuses on limits to emissions, hardly acknowledges the essential need to down-draw atmospheric carbon which has already reached >450 ppm CO2 + Methane equivalent. Linear temperature rise projections issued by the IPCC summaries for policy makers take little account of the non-linear to abrupt behaviour of atmospheric conditions, as indicated by sharp climate instabilities during the last glacial-interglacial ages, consequent of amplifying feedbacks from land and ocean. IPCC reports, based on credible scientific peer review papers, have been prefaced by summaries for policymakers, in part edited by government representatives. Consequently the urgency of the climate crisis has been underestimated. Temperature goals such as 1.5oC or 2.0oC constitute political goals, not science-based values. The concentration of atmospheric CO2+Methane of >450 ppm is driving amplifying feedbacks to global warming, namely from warming oceans, melting ice, methane release, fires, desiccated vegetation, push temperatures upwards – unless and until a method is found to draw-down atmospheric CO2. For the above reasons, talk of restricting mean global temperatures to any particular figure, such as 1.5oC or 2oC above preindustrial levels, ignores the scientific evidence as to how the atmosphere behaves. The “Paris target” of 1.5oC is meaningless since: (1) no mechanism is known to arrest amplifying feedbacks rom rising above this limit, and (2) no plans for draw-down of atmospheric CO2 appear to be on hand, the $trillions required for such endeavor being spent on the military and wars. In Australia, it is claimed as if carbon emissions constitute not much more than 1 percent of global missions. However, emissions from coal and gas has been increasing (https://www.theguardian.com/business/grogonomics/2018/jan/09/australias-emissions-are-rising-its-time-for-this-government-to-quick-pretending). Including exports Australia produces near 4 percent of global emissions, all of which goes to the same atmosphere. Rarely has the full extent of the climate catastrophe been conveyed by the mainstream media, including the ABC, as contrasted with the proliferation of pseudo-science infotainment programs, where attractive celebrities promote space travel. Rarely do the major panels include scientists. Yet the warnings are shunned, in particular in rich western countries. Whenever the term “future” is expressed in the mainstream media and in Parliaments, it is rare that a caveat is made regarding the effects of global warming, Should there be a future investigation of those who have been, continue to, promote and preside over the rise in carbon emissions, with the consequent climate calamity, this would be recorded by survivors as the greatest crime ever perpetrated by the Homo “sapiens”. Andrew Glikson: Earth and paleo-climate scientist.